Also, A-Rod incorrectly predicts many pitches before they happen in his ESPN broadcasting debut. This is our look at the most popular — or in some cases our personal favorite — sports media videos recently shared on Clippit. Clippit is an awesome app that allows us to quickly grab 30-second clips from several live TV broadcasts and share them on social media. Michigan Wolverines star Moritz Wagner had quite a Saturday night. 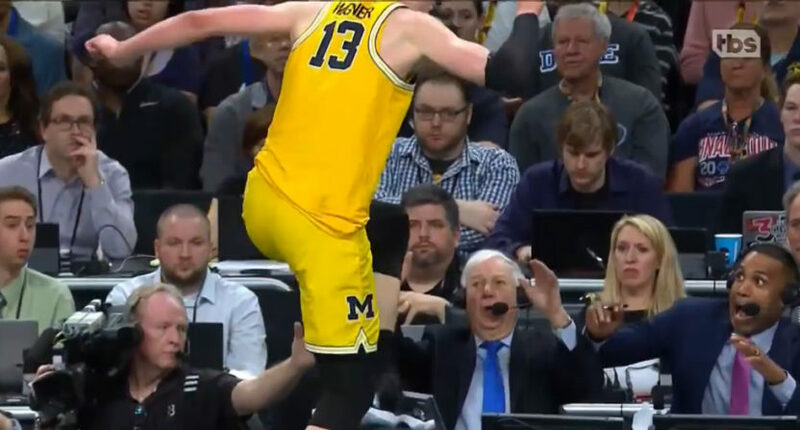 The junior scored 24 points to lead Michigan to a 69-57 Final Four victory over Loyola-Chicago, and he also went flying over the announcing crew’s table. That resulted in Bill Raftery’s glasses being broken and Grant Hill making an incredible, terrified face. Wagner later apologized to Raftery and congratulated Hill on making the Hall of Fame, which the announcers certainly appreciated. Nantz’s pronunciation of “meme” certainly didn’t go unnoticed by the folks on Twitter. Jim Nantz saying "me-me" is a better meme than the actual Grant Hill meme. Jim Nantz pronouncing "meme" on national TV like he's Beaker the Muppet has made my entire tournament. Matt Vasgersian, Alex Rodriguez, and Jessica Mendoza made their debut as the new ESPN Sunday Night Baseball crew for opening night’s Dodgers-Giants game. There’s a lot to like about the crew, and it’s going to take some time to get the chemistry right, but there were certainly some mistakes and awkward moments on the first broadcast. A-Rod tried to go Tony Romo and predict some pitches before they happened, but that didn’t go so well. Vasgersian didn’t get a good read on this Joe Panik homer that would serve as the only run of the game (and same thing the next night). And ESPN — for some reason — also decided to show us Jennifer Lopez going up to the booth and giving A-Rod a kiss.